Why is there no inner turmoil in us? Why is there no true love?Strange are the routes to Bhakti. Science can also be one. Prahlad Tipanya, the Dalit folk singer who teaches science at a school in Luniakhedi village of Malwa, UP, says his intense bonding with Kabir is because Kabir is scientific. “Kabir never spewed out abstractions. In fact, he said don’t believe what is not part of your experience. Isn’t that what science says?” asks the committed singer. Kabir spoke of what he saw. What you read in his dohas is what has stemmed from his real experiences. Hence Kabir, for the singer, is a medium through which an individual understands his ‘self’. After a brief meet with Kabir in textbooks during school days, Prahlad Tipanya had no intentions of studying Kabir. Putting it eloquently, he says: “It was sometime in the Eighties… he landed in between me and my life and I got hooked on to him.” Explaining further, he says how the trigger to study Kabir’s poetry was actually the tambur, which endlessly fascinated him. “I wanted to learn the tambur, and then I started singing Kabir,” says Prahaldji, who believes that even those who are caught up in their worldly selves can relate to Kabir. The deeply-spiritual Prahladji in his captivating style mixes song with commentary. Even as he keeps strumming the tambur, he explains the philosophy of the song and speaks of other dohas that share similar concerns. Not dulled into the rigour of the ritual like many other Kabir panthis, Prahladji is a rationalist. In fact, seeking to reform the conformist nature of the Kabir followers, Prahladji even became the Mahant for a brief period. He put himself through the rituals, hoping to understand the complex nature of bhakti, and thereby help bring about a reformation. But soon the Kabir Math found him too critical of its practises and relieved him of his position. “Kabir was above all this, what an irony to confine him into things he abhorred,” he observes. “I’m sure that in everyone’s life there are incidents that rise above Allah, Ram and Raheem — of their respective gods and religions. If boundaries were permanent, then religion, caste and conservatism would be the ultimate truths. Kabir is the final truth because his thoughts are an outcome of the humanist in him. That’s why I sing only him,” he reasons. Talking to Prahladji is talking about Kabir. He will invariably speak about the mystic poet and keeps finding himself through him. In fact, Prahaldji is constantly thinking, revising and extending his observations. “Every word of Kabir wounds you. It takes you to a shoonya; takes you closer to yourself. Kabir refuted the primacy of one god. In fact, he urged that we rise above all the gods,” he explains. Around the Babri Masjid episode, Prahladji went to Ayodhya to sing Kabir. “The Ram that Kabir speaks of doesn’t just belong to the Hindus. He’s certainly not King Dasharatha’s son – Kabir’s Ram resides in every body, that body which is an earthen pot. ghat ghat mein baita Ram…,” he sings. “He’s nirgun-nirakaar (he’s formless, the one with no physical attributes)…,” says Prahladji and laments that we not only trap our gods into physical forms but also into our thinking. “We territorialise our gods,” he adds.As he sways to his music with his eyes shut, he asks: “Can one breath be distinguished from the other? Can they be bound in compartments of caste and religion?” The endless names of God are but emotional expressions. Bhakti for him is love, is togetherness and it’s also the seat of mukti (salvation). Having been an activist with an organisation called Ekalavya, Prahladji is deeply troubled over issues of caste and discrimination. “Air mingles into air, water into water and soil into soil…what are we quarrelling over?” All the money that he earns from his music performances and 20 percent of his salary goes for the propagation of Kabir. “Why is there no inner turmoil in us? Why is there no true love? I want to do as much to bring people into the fold of Kabir,” says the sincere musician, who believes that Kabir inhabits the middle position; he is at the gate which connects the inside to the outside. Prahlad Singh Tipanya first heard the tamboura, a 5-string plucked instrument, in 1978, and was captivated. He was 24 years old then, a village schoolteacher and singing was not an inherited family tradition. However, this became a defining moment for the way his life was going to unfold. For it was through the tamboura, that Prahladji encountered the world of Kabir. The words of this 15th-century saint-poet are sung in village after village by scores of bhajan mandlis who have kept alive an unbroken oral tradition of singing Kabir’s poetry for over 600 years. Prahladji entered this world of all-night bhajan sessions as a learner. Two and a half decades later, he is a household name, his audiocassettes can be heard in home after home, and most will acknowledge him as the man who has deeply impacted and contributed to a resurgence of oral traditions of Kabir singing in Malwa region, in Madhya Pradesh. Prahladji combines a powerful singing style with a magnetic ability to communicate with his audiences. His concerts are more than entertaining music. They are powerful engagements with the spiritual and social thought of Kabir. In Malwa region, he is admired not only as a singer, but also revered as one who propagates with great personal intensity and engagement, the spiritual message of Kabir. His concerts stress the need to rise above petty divisiveness, sectarianism, empty ritualism and idolatry and the need to adopt love as the ultimate religion. Unswayed by the trends of mixing filmy tunes and synthetic sounds in folk music, Prahladji has resolutely nurtured a Malwi folk music idiom. A new sound he is responsible for introducing is that of the violin, which has now become a trend for bhajan mandlis of his area. He performs with his troupe consisting usually of 7-8 members, including the tamboura, kartal, manjira, dholak, harmonium, timki and violin. He has performed to audiences at a state, national and international level. In 2003 his troupe performed in the UK, and also toured the US for over 2 months. 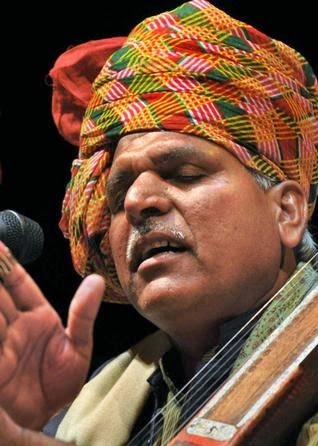 He has performed since 1980 on All India Radio stations in Indore, Bhopal, Jabalpur, Patna, Lucknow and Kanpur, and is the recipient of several awards. In 1997, Prahladji set up the Kabir Smarak Seva Shodh Sansthan, on a plot of land granted to him by the state government opposite his home in the village of Luniya Khedi. This registered trust organizes an annual event, where several thousands congregate to listen to Kabir’s words through bhajans and discourses by gathered singers and spiritual leaders. A fledgling school is already in operation and further plans include a library of Kabir-related writings and a meditation hall.